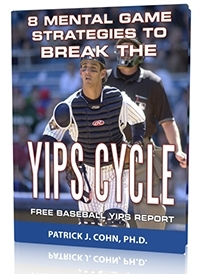 The yips are a reality that can hinder a baseball player’s progress and derail his career. The perceived inability to throw the ball where you want to can be like an insurmountable mental block. But understand that the yips is a “perceived inability.” You didn’t lose the ability to throw. The ability to make accurate throws is still within you. You just have bought into a belief and have given life to something that is not entirely true and that negative belief affects the way you play the game. For example, some batters hit for average and do not have much power in their swing… These batters believe they are not home run hitters, so they do not swing for the fences; it goes against what they believe to be true for themselves. If a pitcher cannot throw a slider for strikes against left-handed hitters, they will utilize the other effective pitches in their arsenal against these hitters. Baseball players rarely attempt something that is counter to their self-belief. When you believe you can’t make the throw, you will be hesitant when you have to make the throw. No wonder why you sail the ball or bounce it in the dirt… that is a whole lot of information to digest while throwing. To make matters worse, you compound the problem by worrying about every potential negative consequence of an errant throw. Chicago White Sox catcher Geovany Soto is an 11-year veteran, one-time All-Star and Rookie of the Year, who appears to be experiencing the yips although he vehemently denies the suggestion. Soto throws from his knees bracing his glove hand on the ground and falls forward as he sends the ball softly in the direction of the mound. After each throw he lands his throwing hand on home plate and wipes it free of dirt. Soto stated he throws in this manner out of habit, something that happened following a knee injury in 2014. Eric Chavez, A’s broadcaster and 17-year MLB begs to differ with Soto believing the catcher is suffering through the yips. The mental block Soto is battling causes him to overthink the act of throwing as if he is actively giving himself step-by-step instructions as he throws. This conscious awareness causes Soto to be mechanical, jerky and unnatural. When dealing with the yips, it’s either trust or bust! 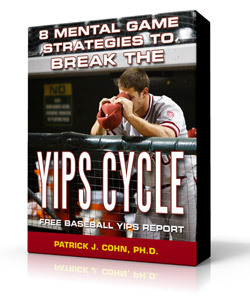 The good news is that you can overcome the yips by improving your mental game. Make a counter-argument. Just because you think something doesn’t make it factual. Stop making a case for the yips. List all the reasons for why you can make this throw that you have effectively made thousands of time. 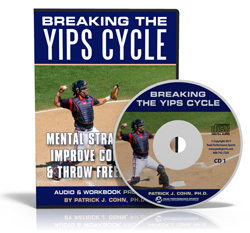 Beat The Throwing Yips With Expert Mental Game Coach, Dr. Patrick Cohn!